KIEV, Ukraine – The conflict in eastern Ukraine has escalated to its most critical level yet, with Russia giving signs that experts say show it is closer than ever before to invading and waging a full-scale war against its Slavic neighbor. Pro-Russian rebels ride their APC and truck as they celebrate Paratroopers' Day in the city of Donetsk, eastern Ukraine Saturday, Aug. 2, 2014. In the past week, Russia has deployed thousands of troops and combat vehicles, and advanced multiple launch rocket systems along its western border, according to Ukrainian and U.S. officials. Russia’s Defense Ministry has denied the allegations, and instead said it was Ukraine that has intensified actions along its border. 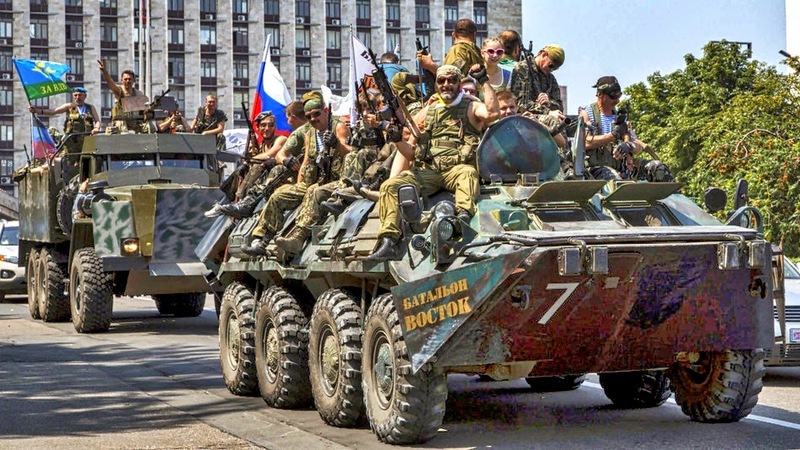 However, satellite imagery and amateur videos suggest that Russia’s military is within a mere hour's journey to Ukraine’s embattled Luhansk and Donetsk regions, where Russian-backed separatists continue to fight pitched battles with government forces. Mashable could not verify the authenticity of the video that purports to show Russian armored vehicles, military trucks and helicopters staging near the Ukrainian border. In another video from Thursday, a column of Russian armored vehicles appears to roll through the town of Gukovo, Rostov region, near the border to Ukraine. “We watch the materials move from inside the central military district in Russia to the area of Rostov, where they are assembled, then meet, train and move towards the border, and we see them across the border,” he reportedly said during a press conference after visiting NATO troops in Kosovo. Moscow has spoken on several occasions of the possibility of sending peacekeepers to eastern Ukraine to ensure the safety of ethnic Russians, much to the dismay of Kiev. There is no need to send peacekeepers –- least of all Russian peacekeepers –- to eastern Ukraine, Valeriy Chaly, deputy chief of Ukrainian President Petro Poroshenko’s staff, said in a statement posted to the presidential website Wednesday. Russian military helicopters carried out ground-fire exercises on Friday in the country’s Rostov region, which borders Ukraine’s eastern Donetsk region. At the same time, Russian combat aircraft and helicopters violated Ukraine’s airspace, flying as far as 10 miles across the border, according to Andriy Lysenko, spokesperson for the Information and Analytical Center of Ukraine's National Security and Defense Council. “In particular, the flights of four Ka-52 attack helicopters from the side of the Russian Federation were recorded yesterday,” he told reporters at a briefing in Kiev. Some may argue that the war has already started. On Thursday, officials in both Kiev and Washington reported that Russia had bombarded Ukrainian forces with artillery fire from Russian territory. Previously, the U.S. released images it said proved Russia had fired into Ukraine. Moscow responded by saying the images were doctored. On Friday, reports indicated the Ukrainians and Russians exchanged rocket fire across the border; both have blamed each other in the past for doing so. In one case, Russia said a rocket fired from Ukraine struck a home on Russian soil, killing a man and injuring two women. Mark Galeotti, a Russian security services expert and global affairs professor at New York University, told Mashable by phone that Russia’s moves were indicative of pre-invasion preparation, but he emphasized that Ukraine and Russia are not yet engaged in all-out war. “Russian planes would be hammering Ukrainian bases and such,” he said. It is also the same time of year when Russia invaded Georgia in 2008. Back then, Russia moved troops to the border, and flew warplanes over Georgian territory. Russian jets have also on several occasions in past months violated Ukrainian airspace, according to officials in Kiev. Shortly after, Russia carried out airstrikes in South Ossetia before moving tanks and troops through South Ossetia and into Georgia. Melnyk also pointed to the Georgian scenario that seems to be playing out. And like Galeotti, he said Ukraine and Russia aren’t quite at all-out war. “It’s still like testing grounds. But I wouldn’t rule out that one day Putin will task his forces to either launch a massive attack from the Russian territory using artillery, airpower to attack Ukrainian forces. Or, he will task the so-called peacekeepers to cross the border and take over … not only Luhansk and Donetsk territories, but across a wider area,” he said. “But signs of military exercises is a classic first step of aggression,” Melnyk said.